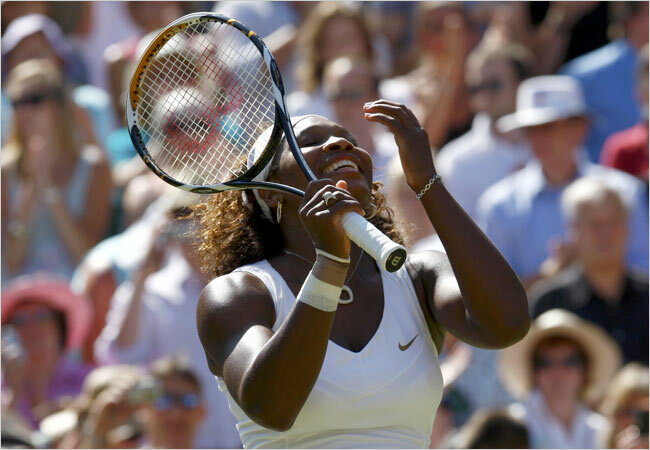 Serena Williams won her first Wimbledon championship since 2003. Even for those who had watched the forehands and two-handed backhands closely on this breezy afternoon, Adamson’s words still had an odd ring. Wimbledon has long been the Williams sisters’ territory, but it was Venus, not Serena, who had the biggest stake in the place. It was Venus who had won five singles titles, including the last two. It was Venus who had won 20 straight singles matches and until Sunday, 34 straight sets. But despite few hints of regime change in the early rounds, this did not turn out to be her year. Instead, it was younger sister Serena’s turn to keep the Wimbledon inscribers busy. Serena broke open this often edgy final midway through the second set, then secured her third Wimbledon singles title by breaking Venus’s serve in a tight final game to win, 7-6 (3), 6-2. “There’s no easy to losing, especially when it’s so close to the crown,” Venus said. Venus williams defeated by hew own sister serena on wibledon final 2009. Crowns are actually reserved for the queen in England, but women’s singles champions at Wimbledon are handed the Venus Rosewater Dish, the elegant plate that has long looked and, above all, sounded just right in Venus’s possession. “It’s named the Venus, and she always wins it, and it’s just like wow,” Serena told the Centre Court crowd in her meandering postmatch remarks in which she thanked everyone from her god Jehovah to Nike. “It hasn’t settled in that I won yet,” Serena said. She last won here in 2002 and 2003, beating Venus in both finals at a time when she dominated the women’s game: holding, at one remarkable stage, all four of the Grand Slam singles titles. Serena’s victory Saturday provided the latest confirmation that she is back on another historic run. At age 27, she now holds three of the four major singles titles: Wimbledon, the Australian Open and United States Open. Difficult as it may be for tennis fans to fathom, she will still remain a relatively distant No. 2 behind Dinara Safina when the latest rankings are issued Monday. Safina, beaten by Venus, 6-1, 6-0, in the semifinals here, has yet to win a major. Serena has pointed out in the past that she feels like the rightful No. 1, but she has changed her stock response in recent months, saying that Safina deserved the spot because of the consistency of her regular tour results and her ability to go deep, if not all the way, in the major events. But Serena could not resist the opportunity provided by Saturday’s victory. Her voice and regard were full of irony. But did she see herself as No. 1? Already struggling to keep a straight face, she soon abandoned the effort, laughing hard along with the reporters in the room and leaning forward and putting her head down on the table in the interview room. In Safina’s defense, Serena has indeed saved her best for the Grand Slam events. Her three major victories are her only tournament victories in the last year. Serena’s ferocity, particularly when cornered, will be one of her biggest legacies to the game, along with her contribution to the extraordinary sibling rivalry that she now leads by 11-10. But as it turned out, Venus was not Serena’s toughest opponent this year at Wimbledon. Serena had to save a match point in the third set against Elena Dementieva in the semifinals, and this is now the third time in her career that she has won a Grand Slam singles title after saving a match point along the way. The others came in the Australian Open in 2003 and 2005. With her 30th birthday looming, Venus had struggles of her own at Wimbledon this year, and one of the differences Saturday just might have been the extra bit of predominantly white attire that Venus was sporting on her left knee. She began taping that knee during the second round, and her father and coach, Richard Williams, who left London before his daughters’ latest final, said before he departed that Venus was in pain earlier in the tournament. Venus dislikes discussing injuries, of which she has had plenty in her 15-year professional career. She views her health as proprietary information and is also loath to make excuses after defeats. But she had an abbreviated warm-up before the final, and there were moments as it progressed that Venus did appear to favor her left leg slightly. What is clear is that her knee was no impediment in the first six rounds, which she won without being seriously pushed. At least the first set was close. With both sisters dominating on their serves and looking edgy from the baseline, there were few extended rallies. But the plot line improved in the seventh game when Serena had to save two break points before holding. There was no way for Venus to suspect it yet, but those would be the only break-point opportunities she would have on this sunny, breezy afternoon. Serena later took control of the tie breaker with a forehand winner down the line that gave her a 4-2 lead. She later won the set with a topspin backhand lob winner: no easy feat considering that Venus is nearly 6 feet 2 inches. In the second set, with Venus struggling to get her toss right, Serena broke her sister’s serve for the first time in the sixth game when Venus double faulted. With a 4-2 lead, Serena began swinging more freely, holding serve to get to 5-2 and then finally breaking Venus again to win on her fourth match point. As soon as Venus’s backhand struck the net, Serena closed her eyes and dropped to her knees. Six years later, she was a Wimbledon champion again, and she was soon inside the clubhouse and examining a board featuring the very up-to-date list of women’s champions and happily tracing a line with her finger from 2003 to 2009.